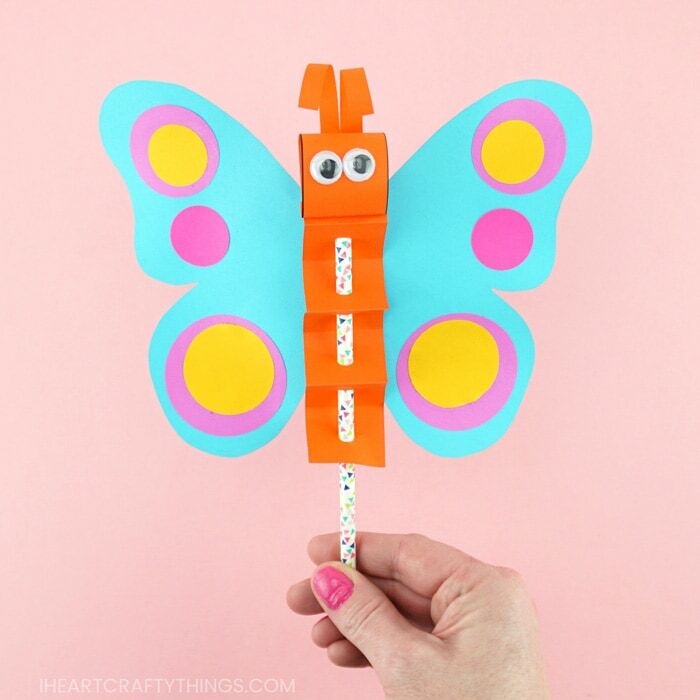 Kids will have so much fun playing with this paper butterfly puppet craft. 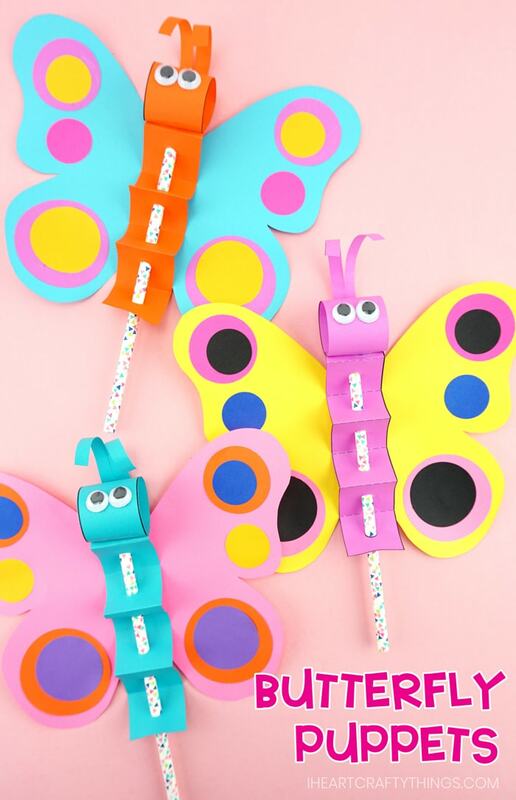 After creating the butterfly with a mixture of different colors of paper and circles, kids hold on to the end of the straw, move it up and down and watch as their butterflies flutter around in the air. 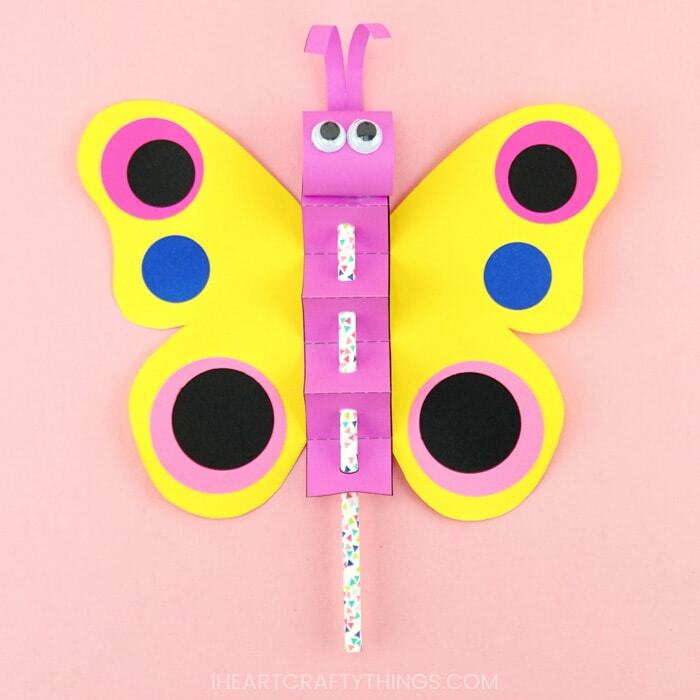 Our handy template makes this butterfly craft super easy for preschoolers and kids of all ages to make. 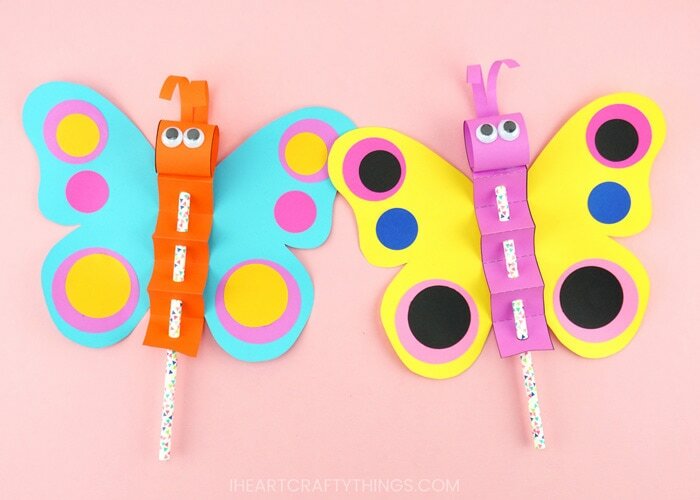 These colorful butterflies are so fun for kids, they won’t be able to stop at just making one. 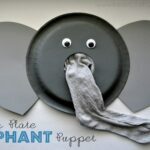 Before you know it, you’ll have a swarm of colorful puppets fluttering around your home. 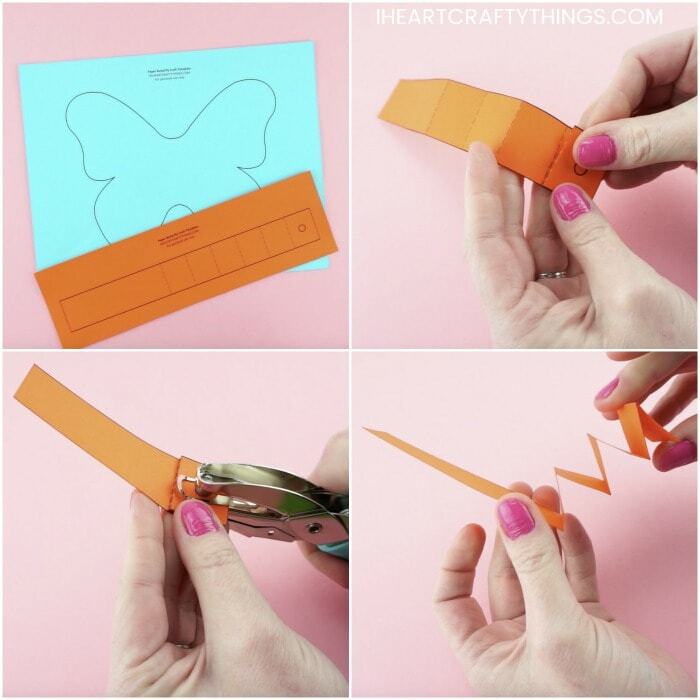 Step 1: Download and print out the paper butterfly craft template. We have a variation with the butterfly body and wings on one page, or a variation with them on different pages to make it easier for classroom use. 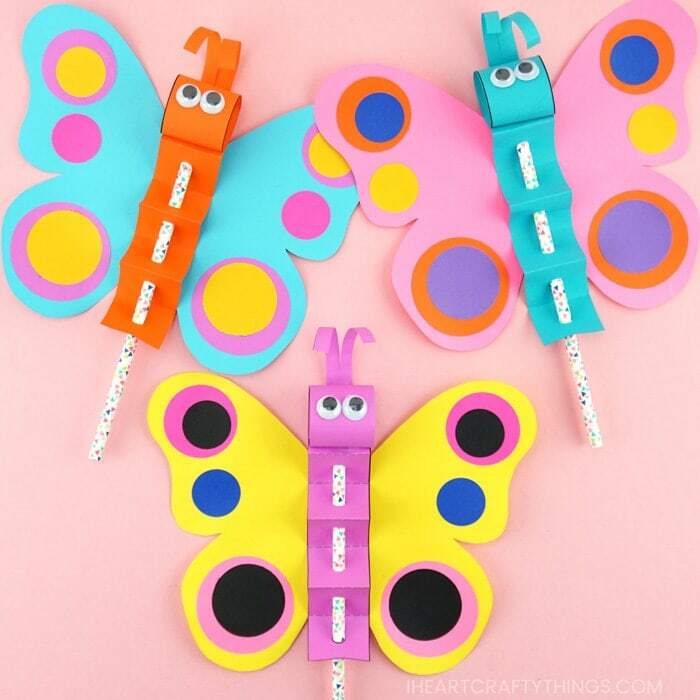 You can either print out the template and use it a pattern to trace the pieces on colored paper, or print out the butterfly wings and body on different colors of paper. Cut out each of the pieces of the template. Step 2: The butterfly body template has dashed lines to help as a guide for folding it with an accordion fold. Start at the bottom of the body in the square with the circle in the middle of it. Fold it backward along the dashed line. Then fold the body up and down again along the dashed lines in an accordion fold until you reach the final dashed line. Don’t worry about the long end hanging off of the body right now. This is to create the butterfly head in a later step. Step 3: Use a hole punch to punch a hole on the circle of the butterfly body while it is accordion folded. Step 4: Feed the butterfly body into your paper straw through all the holes of the accordion fold. The top of the body will hang off the straw quite a bit. Step 5: Add glue on the underside and end of the long piece hanging off the straw. Then curl it around into a circle and secure the end on the first accordion fold on the front of the butterfly body to make the butterfly face. See pictures above as a guide. Step 6: Grab your paper scraps leftover from cutting out your butterfly template. Cut out a small rectangle piece for antennae. 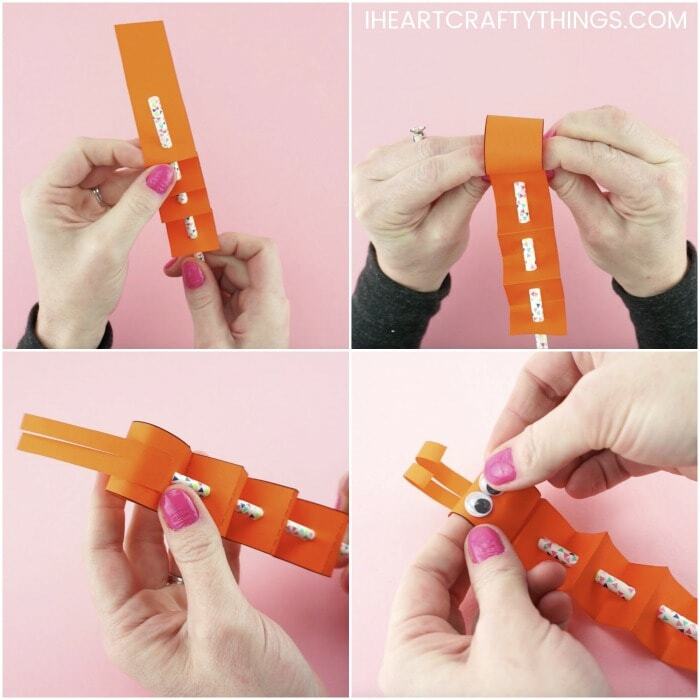 Cut down the center of the rectangle to make two separate antennae. Add glue to the bottom of the rectangle antennae and glue it on the back of the butterfly body. Step 7: Use scissors or a pencil to curl the ends of the butterfly antennae. Then glue googly eyes on your butterfly. Step 8: Turn your butterfly body face down. Flatten the two accordion folds in the middle of the body and add glue to them. Glue the butterfly body down in the center of the wings. 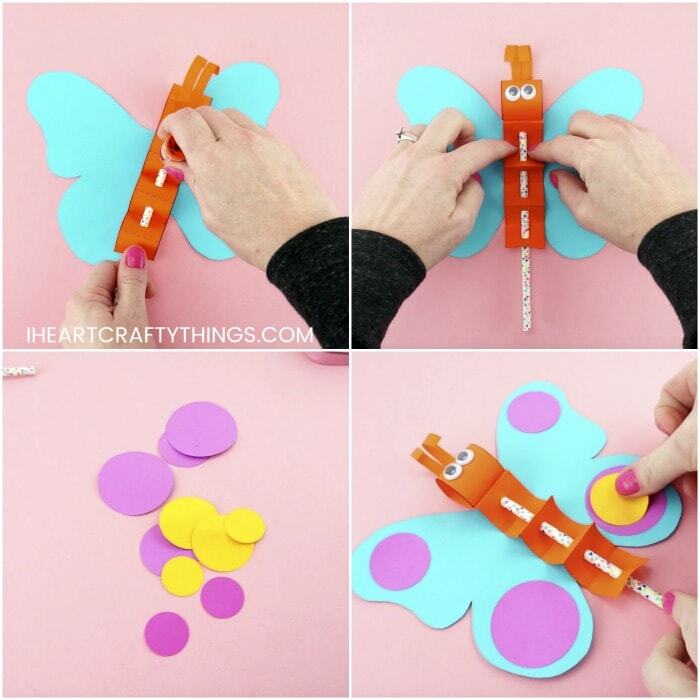 Step 9: Cut out different sizes of circles from colored paper to decorate your butterfly. This is where your circle punches come in handy. If you don’t have them you can just freehand some circle shapes for your butterfly craft. We used two 2-inch circles, four 1.5-inch circles and four 1-inch circles. Step 10: Glue the circles on your butterfly wings. 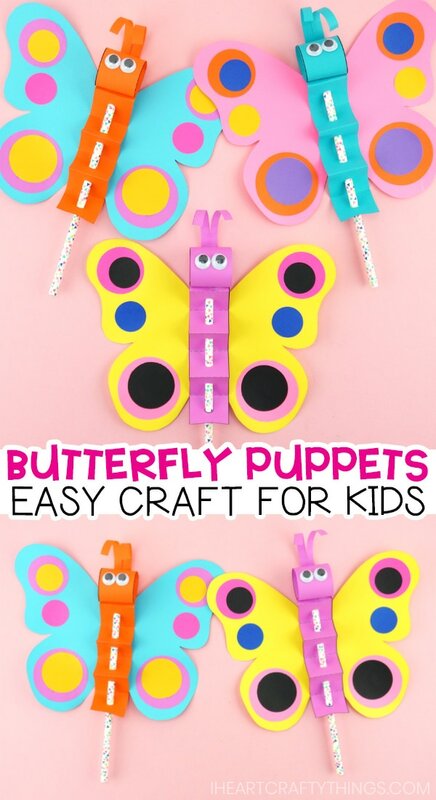 Try layering the different sizes with each other and using a variety of colors to add extra color and dimension to your butterfly puppet. Now it’s time for play! 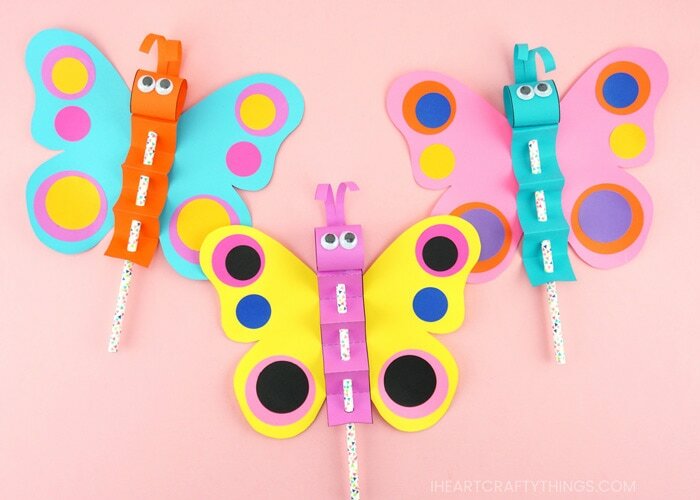 Hold the bottom of the paper straw and have fun flying and fluttering your butterfly around. 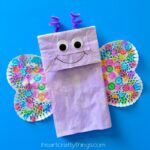 You’ll discover the paper wings actually move up and down which makes this craft extra fun for kids. 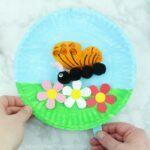 Watch the video below for a step by step guide on how to make this simple butterfly craft with our template. 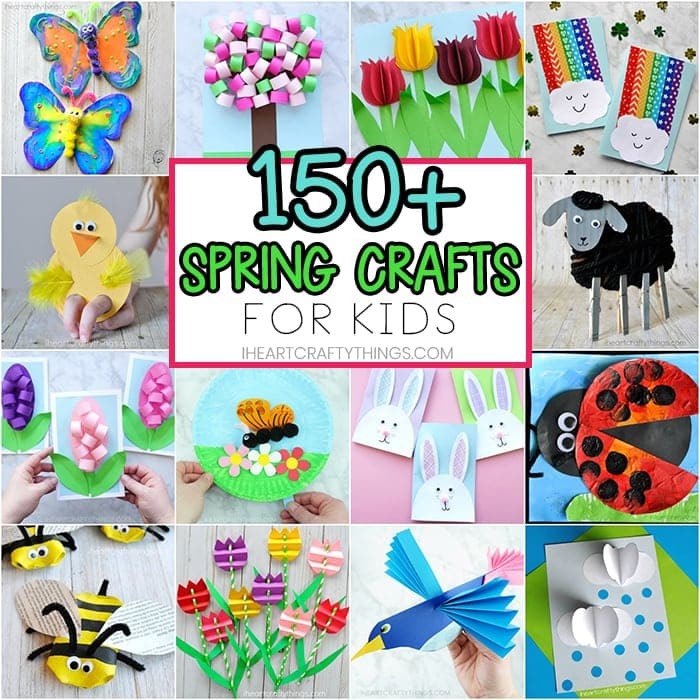 Find more insect craft ideas and spring kids crafts by browsing the categories at the top menu bar of our website. Looking for more flying fun? 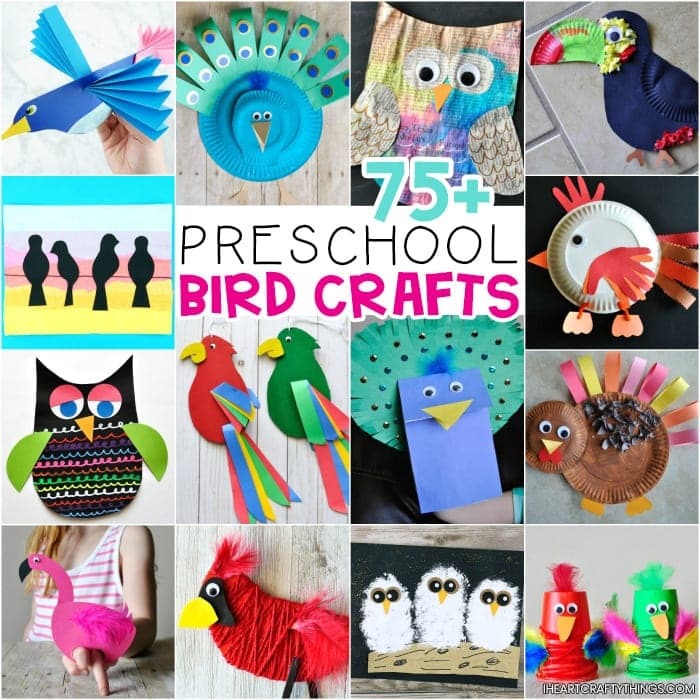 Check out this amazing list of 75+ Bird Crafts for Preschoolers. « Mother’s Day Flower Pot Craft -Easy gift for kids to make for Mom!